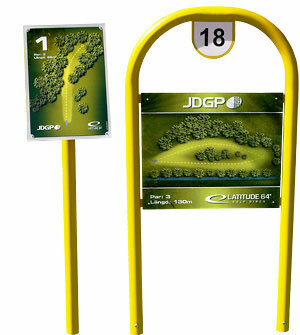 In order to provide course designers with all the tools they need we have designed this Tee Sign. Made out of a 60mm. curved pipe with board attachment in metal. The board itself is made out of UV stable and rigid plastic, it will be a great way to have information about your holes monted on something that will last a long time. Given how most tee signs look today these will for sure make your course look more professional than any other. It is also a way to make it easier to get sponsors since they would rather be presented on our Tee Sign than on a piece of plywood stuck in the ground.